It’s time for another Batman Beyond episode with an added morality lesson as this week the show takes on the issue of addiction as the local teens are getting hooked on a new VR video game, which seemingly has the ability for the players to live out their fantasies only to soon find themselves addicted, a plot its soon revealed to be masterminded by super villain Spellbinder who here makes a much welcomed return. Throughout the history of DC and Marvel comics there have been a number of times were characters have appeared in either comic which have shall we say bore a resemblance to a character in the rival publication I.e. Deadpool >Deathstroke, Green Arrow>Hawkeye, Darkseid>Thanos, Superman>Captain America and the list goes on. True this could be seen as one party trying to cash in on the success of another, or if anyone who’s ever taken a writing class will tell you, the first lesson you learn is that there are no original ideas only variants. This week sees another of those examples as Stalker, a big game hunter arrives in neo-Gotham determined to hunt what he considers to be the ultimate prey….Batman. Another exciting episode this week especially as it introduces the character of Maxine “Max” Gibson who will soon become another key character in the series. The downside though is that she is working on a program to reveal the true identity of Batman. At the same time the Jokerz have found themselves a dangerous new leader in the zombie make up wearing “Terminal” who is leading his goons with a worryingly high level of professionalism, but does he hide an ulterior motive? There is a real theme of passing the torch in this week’s episode as Robert Vance, the owner and president of a major computer corporation uploads his conscious into a computer to enable him to assist with the running of the company after his death. Despite being shut down by his son when he took over the company, thirty five years Vance’s grandson Bobby has now been thrust into the role of company head following the sudden death of his father and seeking advice reactivates the program only to soon be convinced to allow this cyber version of his grandfather access to the internet under the guise of helping him unaware that he has sinister ulterior motives. Despite being a background presence since the first episode, strangely it has taken the show runners until now to actually find something for the shows resident biker gang “The Jokerz” to do outside of being a general nuisance to the citizens of Neo-Gotham. Of course this is not say they are making themselves less of a pain to Terry as this week as they steal a prototype military vehicle (hard to tell if it’s supposed to be a plane or a car in this timeline) and head off on a joyride. Worse still is the fact that the vehicle is powered by an unstable nuclear reactor which is currently set to go critical. If you cast your mind back to my coverage of the first season (or failing that just hit the archive section) you will remember that I noted that in the character of “Inque” the series has essentially reworked the classic villain “Clayface” to fit into this new world and now a mere 15 episodes into the show and they essentially rework him again with this episode as we are introduced to the one shot villain “Earthmover”. Yes this might seem like some very lazy writing, but stick with us here as this episode more than manages to stand on its own merits. After the surprise success of the first season, it was unsurprising that the showrunners would be given twice the episode allotment for the second season which runs for a whopping 27 episodes compared to the paltry 13 of the first season. 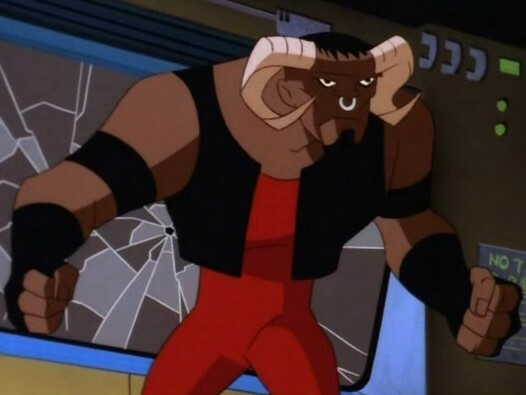 This debut episode starts by introducing a new element to the “Batman Beyond” world as here we get our first introduction to splicers, who are average citizens who choose to splice their DNA with animal DNA in the name of fashion and to give them certain characteristics such as leopard spots or cat eyes. Of course like any fashion style there are those who choose to take it further than most with the results seeing them turning themselves into humanoid versions of their chosen animals. Bruce meanwhile is suspicious of this new trend and more so of the shady Dr. Abel Cuvier who runs the Chimera Institute which is spearheading this latest trend. For those up to speed on their Batman history will understand Bruce’s reason to be suspicious at the mention of gene splicing having had his own brush with these kinds of experiments with the “Man-Bat” in the episode “On Leather Wings” back in the original animated series. Of course like all of Bruce’s suspicions it soon turns out that things aren’t quite what they seem at the Chimera Institute with Curvier looking to take out D.A Sam Young who is trying to outlaw the practice of splicing believing that causes an increase in aggressive behaviour. True it would have been great to have Bruce we wrong with his hunches, but when you look at how obvious a villain Curvier is, especially with his Vincent Price styling even someone who isn’t a master detective would assume something was up with him. The splicers make for a great foe to open the season with, especially when they come with so much unlimited potential, with this episode seeing Terry battling foes that have combined themselves with the DNA of a ram, cobra and tiger respectively, with the ram splicer “Ramrod” being voiced by Ice T in what I would like to say is one of his more random roles but it really isn’t. Even Terry isn’t free of being spliced himself as he finds himself being turned literally into a Batman. The centrepiece of these splicing antics however comes at the finale with Curvier turning himself into an actual chimera before soon warping into something a lot more twisted and which left me wondering where he line is actually drawn when it comes to censoring children’s cartoons as the final form Curvier takes was a lot more shocking than I would have expected to have seen on a mainstream show and more the sort of thing you’d expect from 90’s anime. It would seem in the time which has passed between seasons that Bruce has come to trust in Terry’s abilities as the Batman a lot more, even going as far as stating that the splicer situation is one that they would need to clean up, seemingly indicating that Bruce has now settled in his position as advisor. Equally the episode see’s the first appearance of “Max” a fellow student at Terry’s school who is worth keeping an eye on, especially as she soon becomes another important character in the Batman universe as will become clearer later in the season. Sadly this episode marks the last appearance of the splicers, even though their presence is still felt throughout the show as they turn up in supporting roles, it would sadly not be in a central role but they make for a great season opener. So after thirteen action packed episodes we’ve come to the end of the first season of “Batman Beyond” and with season 2 promising to see the return of certain major villains, splicers and even further development from the jokerz, let finding out how the devious Paxton Powers will play into events in Neo-Gotham. 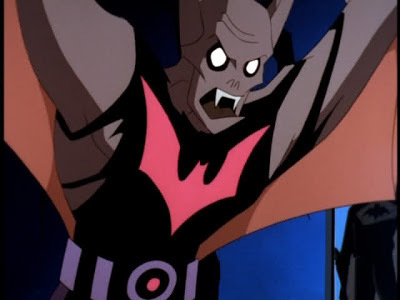 Still for the concept of a futuristic Batman, an idea which could have easily have been written off as a gimmick, the show really has carved out for itself with this first season a place in the DC Animated universe, while its ongoing comic series has ensured that the character has continued to remain very much part of the DC Universe. So after a great first season it comes as something of a let-down that this first season finale ultimately falls so flat. More so when it sets with so many grand ideas to not only wrap up several major plot lines, but also setup the second season all with mixed results to say the least.